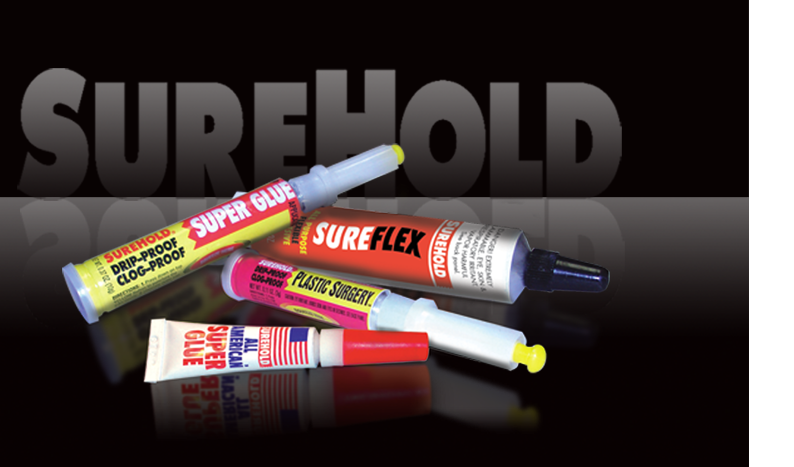 SureHold has a complete line of Super Glue, Epoxy and two unique products called SureFlex Adhesive and Python Glue (Polyurethane). SureHold is known for its innovative and World Wide patented tube design, which is Drip Proof, Clog Proof and Guaranteed not to dry out. Contact your local SUREHOLD sales rep or SUN REP for details. Specifications are available for each item by click on the individual hyperlinks below. Use SureHold’s Rear View Mirror Adhesive to bond a broken mirror bracket back onto the windshield. This product is also great for glass to glass and metal to metal bonds. Apply the accelerator followed by the adhesive and apply pressure for a fast strong bond. Foams less than competitive products at less than half the price! Contact your local SUREHOLD Sales Rep.